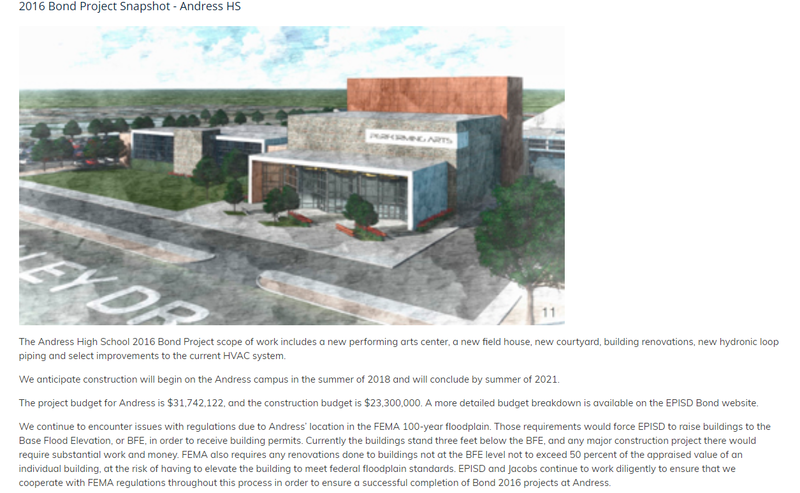 It looks like the Andress High School portion of the bond project is in trouble. The last paragraph talks about the buildings being in a flood plain. When did the district learn this? This entry was posted on Sunday, March 4th, 2018 at 5:00 AM and is filed under El Paso Independent School District. You can follow any responses to this entry through the RSS 2.0 feed. You can leave a response, or trackback from your own site. So??? Much of El Paso is in a flood plain, according to the relatively new FEMA map after the 2006 flooding. If we abandoned buildings in flood plains, El Paso would be full of hole. One of the things we saw in the west side is that when the new flood plain maps were done they took into account that the irrigation canals were poorly maintained. This expanded the floodplain. I know our realtor told us when we bought our house in 97, that it had been on the floodplain but was taken off because of drainage improvements in our area. It’s back on the floodplain now. And in 2006 standing water came within 4 feet of the garage doors. I carry flood insurance now. The NE area of El Paso has always had natural lakes during years of average or above average rainfall. The ranchers and native Americans knew this long before El Paso grew that way and Andress HS was built. The way water flows has not changed, but the designation of flood plain may be new. Andress, Irvin, Charles, Richardson, Terrace Hills and the associated elementary schools are in a “new” flood plain defined by FEMA after the 2006 rains. A lot has to do with the streets acting as feeder streams (rivers)due to slope of streets and the inability of existing flood culverts to handle the flood volumes. I believe, and could be wrong, that these requirements are relatively recent since the discussions in 2015 had pending FEMA floodplain changes discussed.